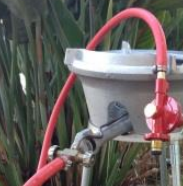 Home › Customer Feedbacks › Isn’t the PF13CL160 model compatible with a 20lb propane tank? Isn’t the PF13CL160 model compatible with a 20lb propane tank? I have been using the wok for a while now and I absolutely love it. It is just so powerful. I am very happy to have found your product and everyone I demonstrate the wok burner to is very impressed. One question that I have is, isn’t the PF13CL160 model compatible with a 20lb propane tank? Am I missing an adapter or could you recommend one? I enjoy being able to use the 1LB tanks, but they do not last very long! This connector can go into a 20lb propane bottle. You tighten it by counter-clockwise.